Below are lists of deposits placed on future puppies. All parent Boston Terrier pictures are on the website. They have all been Health Tested prior to breeding! (JHC Clear- tested or by parentage, BAER-hearing, CAER-eye diseases, Patellas, Heart). If at any time there would happen to be puppies available and no more names on the Deposit List, then I would go to the No Obligation list before posting any puppy available on the Puppies Available page. 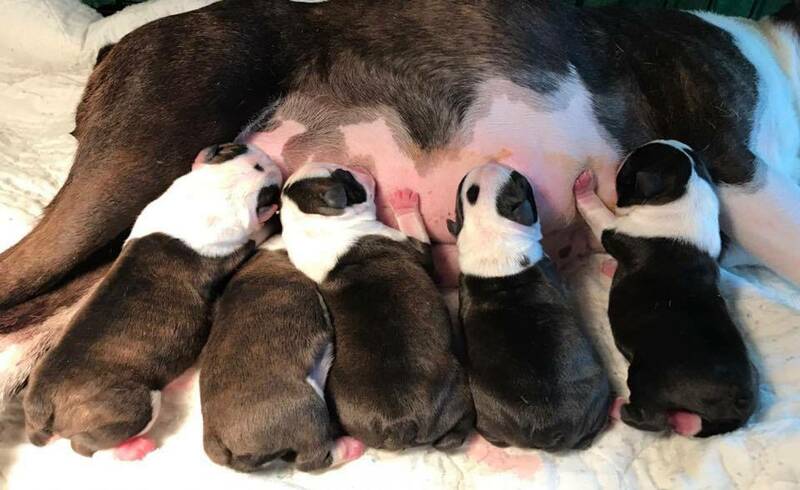 Pet puppies $1800 - $2000 - ALL puppies are sold on Spay/Neuter agreement. Barbara S. - F (7/1/16) Retired adult when next one is available. ADULTS are all health tested, use to being around other adults, puppies, people, kids, larger dogs (GS) and are house trained. They will be spayed/neutered at buyer expense before leaving. ADULTS adoption costs are $700 + cost of spay/neuter. Deposit is $350. If you are too far away to drive, even for me to meet you up to (2) two hours out (for gas fee), I'd be happy to fly your puppy to you in cabin to your airport- hand deliver (for$$ fee + my ticket) OR prefer to meet you at my airport for a face to face meeting with your puppy before you fly him/her back with you. **If we keep your puppy longer than 8 wks of age extra fees will apply.